Wellness exams for your dog, cat or bird. Find a class that is right for you! We provide tender loving care for your pet. Compassionate care taken with all the animals. Downers Grove Animal Hospital is a full service animal hospital dedicated to nurturing the bond between you and your dog, cat, avian or exotic family member. We are located at 635 Ogden Avenue in Downers Grove, IL. You can contact us by phone at (630) 968-2812, by email, or make an appointment online. We are fully equipped to care for your pet(s) when they are sick, but would prefer to keep them healthy! To that end, our primary focus is preventative health care. All of the services you may need for your pet are available under one roof here at Downers Grove Animal Hospital. In addition to standard preventative, medical, surgical, and dental veterinary care, we also offer boarding services for dogs, cats, and birds/exotics; as well as grooming services and dog training on-site. Our facility is currently owned and operated by Dr. Robert Merkin and his sons, Dr. Graham Merkin and Dr. Max Merkin. Downers Grove Animal Hospital is proud to care for patients from the Western Suburbs including Clarendon Hills, Downers Grove, Hinsdale, Lisle, Lombard, Oak Brook, Western Springs, Westmont, Willowbrook, and Woodridge for over 70 years. Downers Grove Animal Hospital has 4 veterinarians on staff; Dr. Robert Merkin, Dr. Graham Merkin, Dr. Max Merkin, and Dr. Sharon Wehling. It is the mission of each veterinarian at Downers Grove Animal Hospital & Bird Clinic to provide the best veterinary care to our patients and the highest attainable level of service to their owners in a friendly, informal environment. Our family would be honored to help you to care for your four-legged family member. Please take a moment and “Like” our Downers Grove Animal Hospital social media pages! Just click on the links and you’ll be on your way. See photos of our staff and add a photo of your own to our wall. We would love to see a picture of our furry friend(s)! "I have been taking my animals to Downers Grove Animal Hospital for close to 40 years! I have always been satisfied with the care my animals have received. My animals always board there as well and I can have a relaxed trip, knowing my cat or dog is get top-notch care." "We recently moved to Downers Grove and took our dog to Downers Grove Animal Hospital initially for vaccines. They were very nice, professional, and the facility was spotless and modern. Shortly after that our dog developed a hematoma in her ear which required surgery. Dr. Max performed the surgery and we have followed up with Dr. Graham. Our dog is doing really well and gets the stitches out next week. DGAH, its veterinarians, and staff exceeded our expectations." "Everyone is very Friendly! The Vet put us at ease by clearly explaining what he thought Charlie was going through. We appreciate the staff and all they do! I am so happy we were referred to this you guys by the West Suburban Humane Society. THANK YOU!" "Coming to DG Animal Hospital is always a pleasant experience. From Dr. Robert Merkin, to the assistants, everyone is kind. Our care is always exceptional. I feel heard with any concerns and the medications can be refilled on short notice. I’d recommend DG Animal Hospital to anyone in need of a veterinarian." "Our dog is so comfortable at this vet for both doctor visits and for boarding. The facilities are clean and pet friendly. The staff is so awesome, both professional and personable. The doctors are excellent." Optimum pet care can add years to your dog's life as well as substantially decrease your cost of treating medical problems associated with aging. Our dog veterinarians provide services to keep your dog healthy including preventive care, nutrition, vaccinations, heartworm testing, elective and non-elective surgeries, dental cleaning for dogs, and more. We also provide dog obedience training, dog grooming, and boarding for dogs. As the only American Association of Feline Practitioners (AAFP) certified cat friendly practice in Downers Grove, we have evaluated every aspect of the practice and its environment from the perspective of the cat. We can proudly say that from the minute they walk through the door, our patients and clients will be a part of a welcoming, comfortable experience that will ultimately lead to the improved health of our feline patients. Our bird and exotic animal veterinarians have taken a special interest and pursued advanced training in the diagnosis and treatment of exotic pets. They can assist you in choosing a pet bird and are trained in several bird diseases. They can also assist with dietary recommendations for your pet bird or exotic animal. Downers Grove Animal Hospital is located at 635 Ogden Avenue in Downers Grove, Illinois. 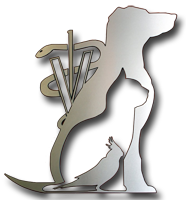 Our veterinarians specialize in pet care for dogs, cats, birds, and exotic animals. Our animal hospital has patients from Downers Grove, Westmont, Lombard, Lisle, Woodridge, Hinsdale, Clarendon Hills, Oak Brook, Western Springs, and Willowbrook, as well as other Chicago suburbs in Illinois.